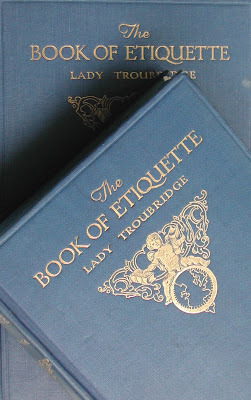 Lady Troubridge, known as Laura Troubridge, Laura Hope and Mrs. Adrian Hope wrote a full two volumes on the proper etiquette of the proper English. She was so proper that when the cast of Robert Altman's Gosford Park was being assembled and needed guidance as to how one might behave at a weekend shooting party in the early 1930's, Lady Troubridge's volumes on etiquette were excerpted for the cast. I feel the cast did a bang up job. As a young girl, Laura Troubridge lost her parents and was trundled off to stay at North Runcton Hall, the home of her grandfather. There, like many Victorian's, she became an avid keeper of journals. Her account of these early years was the basis for a memoir, Life Amongst the Troubridges. Laura Troubridge had a jam-packed life. In the incestuous world of the Victorian upper class she knew the famous and infamous. As a child, she was photographed by Julia Margaret Cameron, whom she found to be quite frightening. After her marriage to Adrian Hope, Laura became an illustrator, drawing respectable, if modest pastels of famous friends and illustrating an occasional children's book. There is speculation that she fell very much in love with Oscar Wilde and after his trial, Laura and Adrian became the guardians of the Wilde children. In the realm of further scandal, she was related by marriage to Una Troubridge who left husband and child to take up residence with Radcliffe Hall. It's hard to believe she had the time to fill two full volumes with etiquette! "Etiquette may be defined as the technique of the art of social life." So begins Lady Troubridge. As August is just around the corner and we all know that the shooting season begins 12 August with our grouse shooting in Scotland, let us review a few things one needs to remember when headed off to the shooting party. "Invitations to country houses for parties are generally for three to five day." During these days one finds a strict gender divide. "The ladies at a shooting party are expected to amuse themselves during the morning after the men have gone off shooting. In the afternoon the hostess generally arranges a drive or some other interest, but it is always open to the guest to do exactly as she pleases. 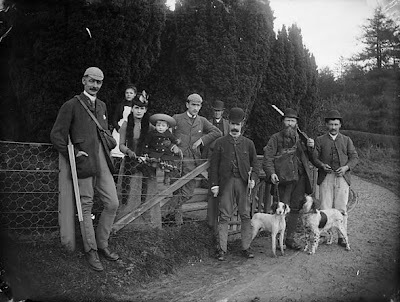 As a general rule, however, the hostess and the ladies of the party join the shooters for a picnic luncheon out of doors. If a lady cares to go out with the men in the morning and watch the shooting it is permissible for her to do so if she is sure that she will be welcome. Some ladies walk with guns after luncheon. If a lady goes out with the guns she must not talk during the shooting or wear brightly colored clothes." "A man who is going to shoot must provide his own cartridges. He is not expected to bring a loader other than his own valet, who will act in that capacity. A loader is provided by the host for a man who does not bring a valet. A loader is not need unless a man uses two guns. A man is expected to have a pair of guns if he accepts an invitation to a large shoot." Confused? Just remember, pack your valet and make sure he brings the ammo. Pack your wife but don't let her bring the fuschia frock. You'll be fine. Just for your info. Laura Troubridge, Lady Troubridge and Laura Troubridge Mrs Adrian Hope were not the same person. Lady Troubridge was Laura Gurney who married Sir Thomas Troubridge, the brother of Mrs Adrian Hope. Mrs Adrian Hope's maiden name was Troubridge and Lady Troubridge's married name was Troubridge. 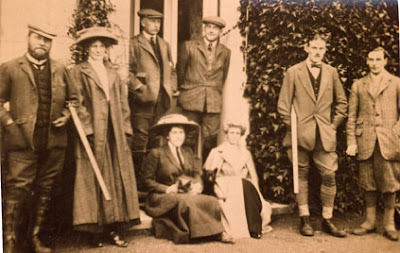 It was her husband Sir Thomas and his sister Laura ( afterwards Hope) who were sent to live with their grandparents at North Runcton Hall, not his wife.The picture you show is of Laura Troubridge (afterwards Mrs Adrian Hope) not my grandmother, Laura Gurney (afterwards Lady Troubridge. I can quite understand the confusion. Anonymous has done a good job explaining the difference between Laura Gurney, later Lady Troubridge and Laura Troubdge, later Mrs Adrian Hope. Anonymous. you have got it right except for one point. "The picture you show is of Laura Troubridge(afterwards Mrs Adrian Hope) not my grandmother, Laura Gurney (afterwards Lady Troubridge". I can quite understand the confusion. Well, Anonymous, I'm sorry to say there is still some confusion. Lady Troubdge, born Laura Gurney, had only four grandchildren: Myself, My Brother(who died young in 1939 and my two sisters. None of us claim to have written this blog so, who, Anonymous are you, the mysteriuos grandchild? I would love to know. Ooooo! interesting comments above! My Bookclub have enjoyed an afternoon tea and readings from the book on etiquette. It's a fascinating social commentary of English upper class life between the wars. Thankyou for this post.